Location : Coming to Pha Long market takes 2 hours by road from Lao Cai town (68km) and 3 hours from Sapa 95km. Locating just few kilometers away from Chinese border, on a hill top amongst perfect nature setting, the Pha Long Market is a very rural and seldom visited by tourists. Every Saturday morning, local peoples from H,mong, Zao, Zay, Pa Zi, Tu Zi and Tu Lao, the 3 small branches of the Bo Y group with just some thousands inhabitants, living in the villages along the border gather here. The colorful traditional clothes of ethnic minorities combining with the beautiful color of mountains and forest will attract any tourists who come here. 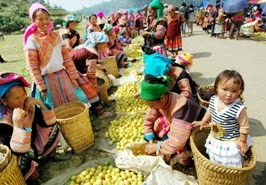 Coming to market is a traditional habit and a beauty of cultural in the life of people here. Attending the market, it is quite easy to realize that many peoples at the market know one another well because the population of the region is small and relationship among the people is strongly maintained. The market is often over around noon, and it is a great experience to follow some local to their village near by for an interesting discovery of local culture and living way. The market surrounding area offers a breathtaking scenery of the mountain terrain featuring with lush forest.